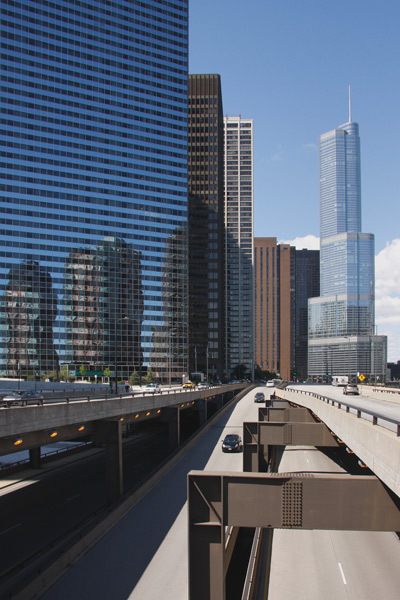 Changes in river direction and the street gridline on North Michigan Avenue presented Graham, Anderson, Probst & White with a challengingly irregular building plot. Two linked structures with angled main facades, a clock tower and the white-glazed terra cotta cladding in Beaux-Arts style memorably combine. 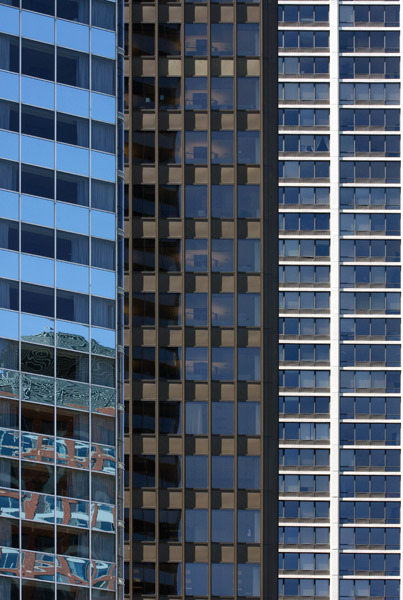 It contrasts strongly with the obscuring Equitable Building by Skidmore, Owings and Merrill. 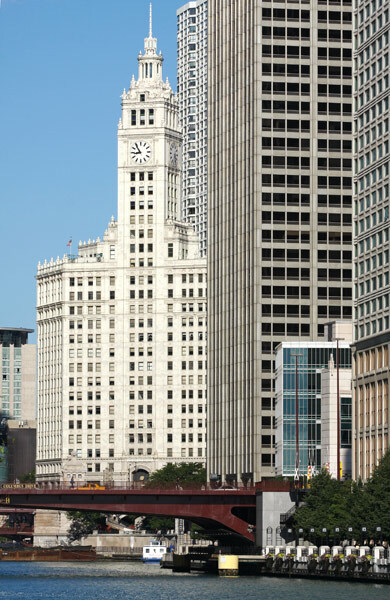 Howells & Hood won the 1922 international design competition for a new headquarters building organised by the owners of the Chicago Tribune newspaper. It is elaborately Gothic-revival in style, with much of the detail concentrated on the upper floors above a more simply detailed shaft. 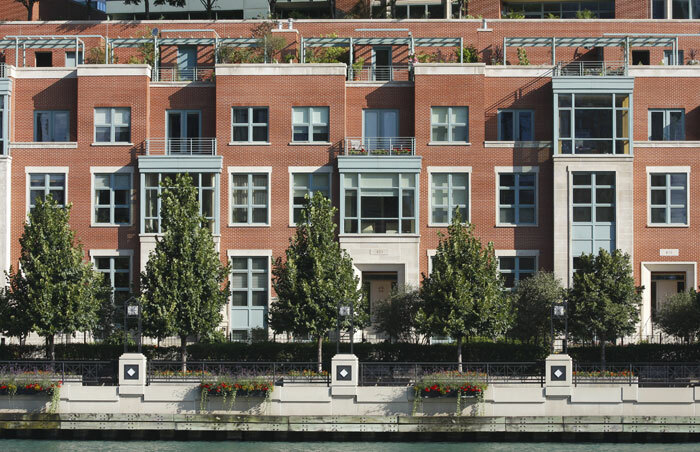 The Michigan Avenue base and three-storey entranceway are enlivened by sculptural details. 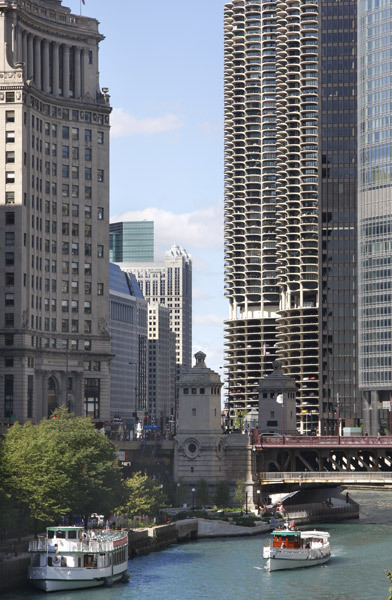 The Wrigley and Equitable Buildings, the Sheraton Chicago Hotel and the NBC Tower are aligned on the north bank of the Chicago River. Promenades on both banks provide pleasant routes from which to explore the architecture of the surrounding streets. 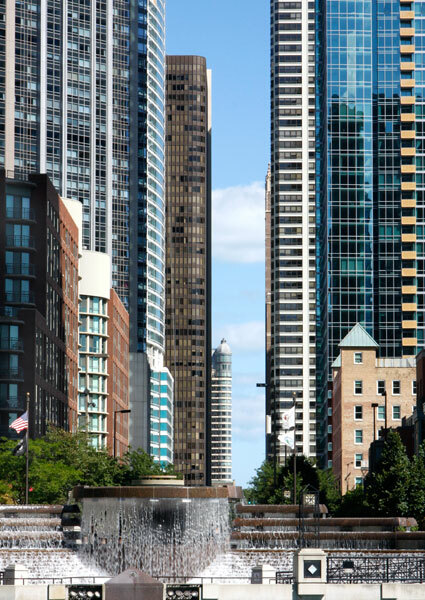 It is also a superb architectural experience to walk the whole south-side river route from Lake Michigan to South Wacker Drive west of The Loop. 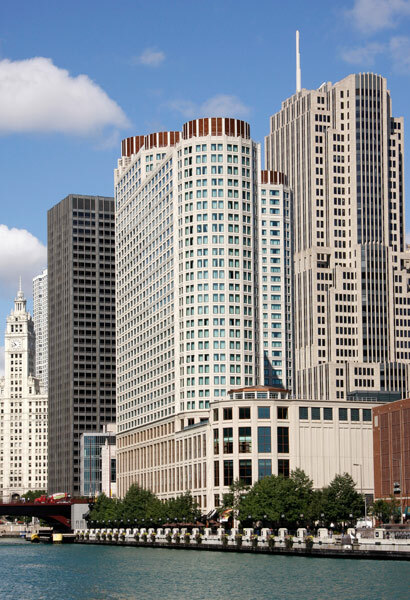 The Sheraton Chicago Hotel & Towers is a Post-modern concrete structure by Solomon, Cordwell, Buenz & Associates. 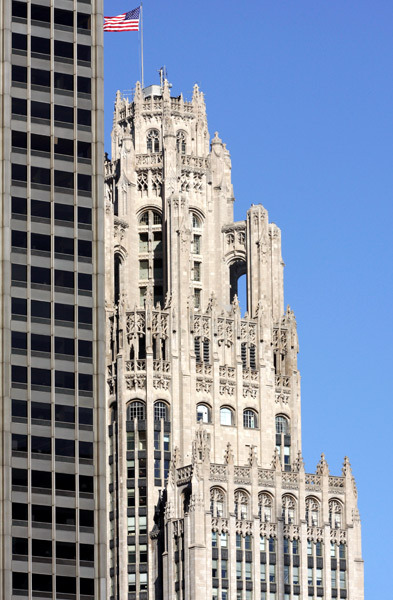 It refers to designs by 'Chicago School' architects such as Louis Sullivan and Daniel Burnham working the turn of the twentieth century. The Adrian Smith/SOM's NBC design echoes the setbacks and the strong verticality of the recessed window strips in a classic Art Deco skyscraper. The Slohan Associates design is said to symbolises man's relationship to water and it celebrates the centenary of the Chicago Sanitary District and its work on improving the grossly polluted Chicago River. Periodically, an arc of water is projected eighty feet towards the other bank. 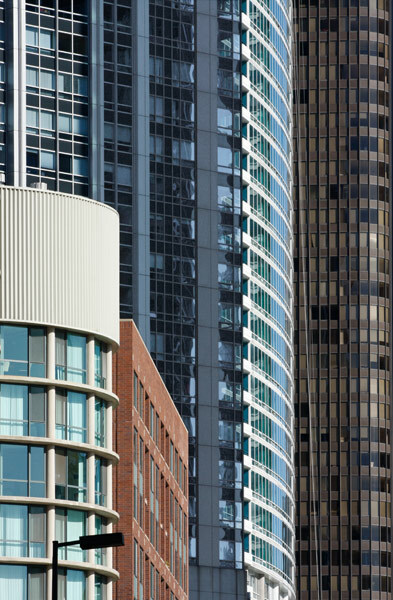 Flanked largely by apartment buildings, McClurg Court provides access to new developments north of the river. A zoom lens compressed the narrow perspective across the facades of several towers on the street. 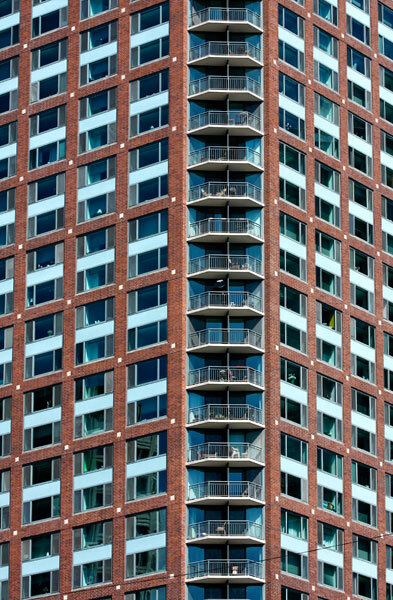 Part of the Cityfront Center development, Cityfront Place is a 40-storey building apartment building completed in 1991 to designs by Gelick Foran & Associates. It is square in plan with the facades set at forty-five degrees to the river. A substantial and largely windowless brick base provides a swimming pool, car parking and other facilities. This elevated "dead end" had little traffic but enabled high views over the river and westwards. The Swissotel is to the left, whilst the 2009 Trump Tower and the dark form of Mies Van der Rohe's 1973 IBM building close the view. Swisshotel - Harry Weese & Associates 1989 + Three Illinois Centre - Fujikawa, Conterato, Lohan & Associates 1980 + Columbus Plaza – Fujikawa, Conterato, Lohan & Associates 1980. 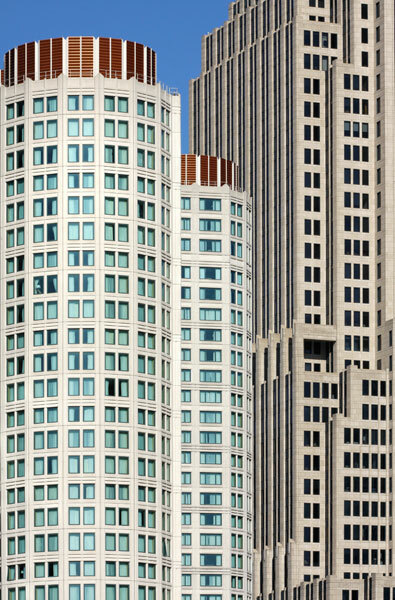 A zoom lens compresses the perspective of these aligned buildings to contain a formal composition that I like to make. 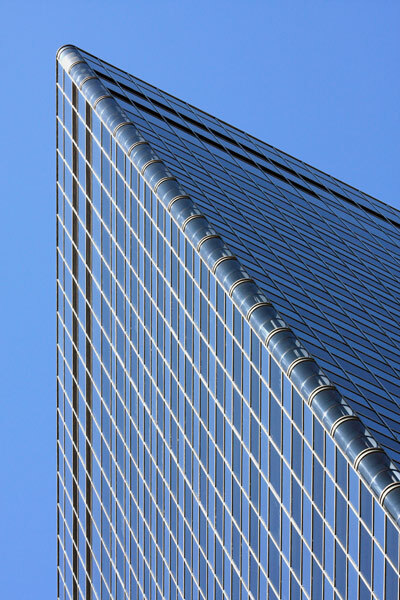 Its equilateral triangle plan-form and silvered glazing make this a distinctive building. In very marked contrast, the same architect designed the triangular Chicago Metropolitan Correction Centre on Dearborn Street that sparingly features slit windows only five inches wide in its concrete slab walls. Judging by interior photographs, the cylindrical corner glazing seems to have no other interior purpose other than curtain storage and diffused light admission. 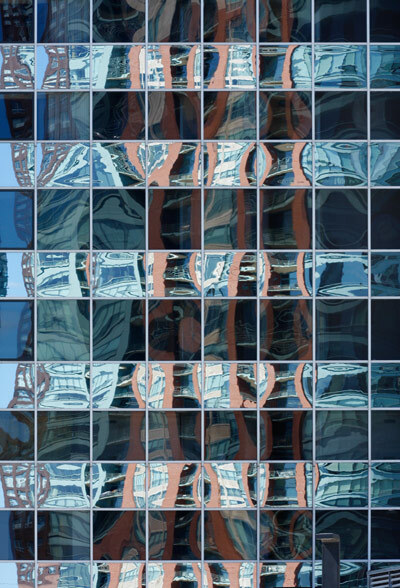 Externally, it provides an elegant link between the facades and their chessboard fenestration. 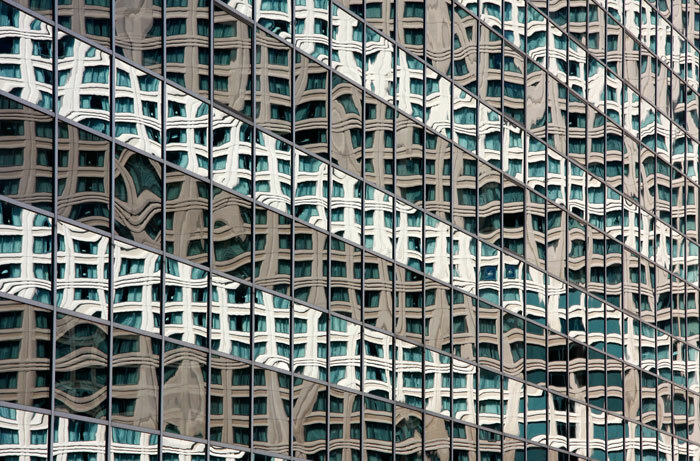 This is a section from the reflections of the River View 2 apartment block built alongside the Centennial Fountain across the river. 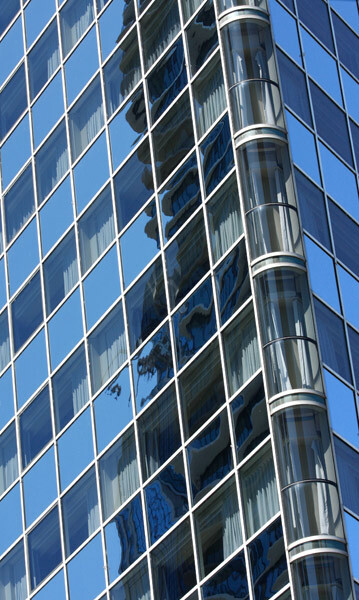 The Sheraton Chicago Hotel is one of the largest in Chicago and this reflection of its extensive façade occupies much of this elevation of the Swissotel. This 70-storey residential tower is set on the shore of Lake Michigan and is the last private construction to be allowed east of Lake Shore Drive. George Schipporeit & John Henreich designed the gracefully curving three-lobe form that is skinned with bronzed glass set in gold anodised frames. Students with Mies van der Rohe, they took inspiration from his unrealised 1922 design for a building in Berlin. Part of the north-bank promenade fronts residential terraces that are modest in scale and overlooked by tower blocks much as small plants on the edge of a herbaceous flower border are set against taller and more substantial growth. The brickwork and trimmings echo the materials used in the rearward and unseen River View 2 of 2004 that was designed by DeStefano & Partners. The Michigan Avenue Bridge of 1920 crosses at an S-bend in the Chicago River. To the left stands Alfred Alschuler's London Guarantee & Accident Building of 1923 whilst to the right are slivers of the bronzed modernist IBM Building of 1971 and the 2009 Trump Tower Hotel. 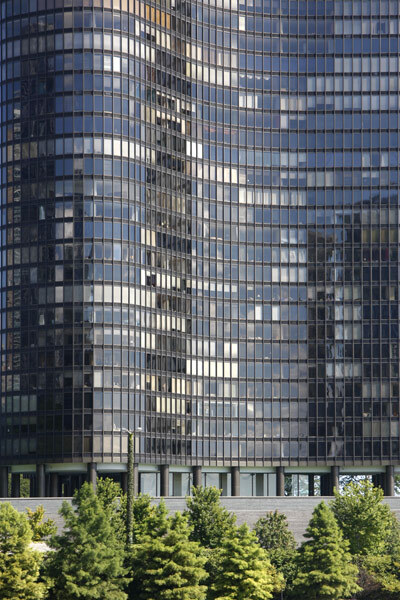 The twin Marina City towers and part of the architectural parade on Wacker Drive occupy the centre. 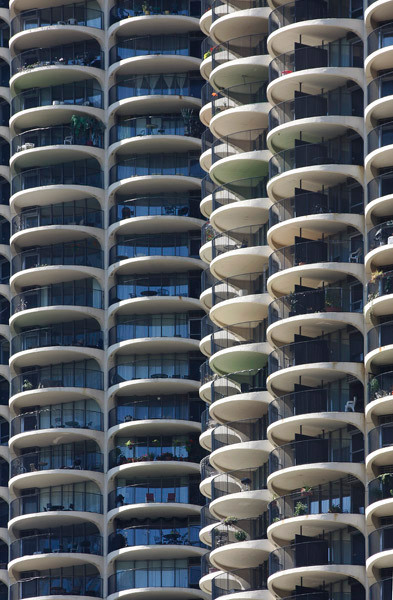 The single north control house on the State Street Bridge has as backdrop the spiralled parking ramp of the Marina City towers. 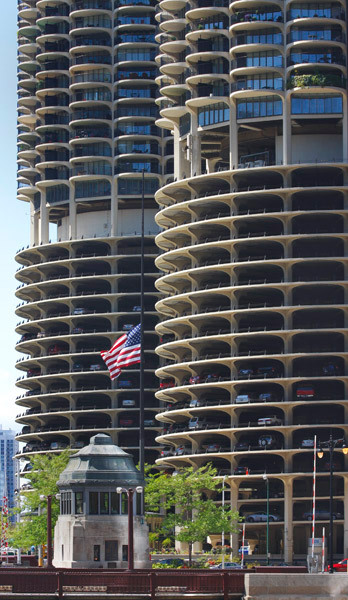 Cars occupy nineteen floors under forty-two floors of apartments that fan out from the central elevator core. Street level buildings currently house a concert hall, a bank, a bowling alley and restaurants, all built above boat moorings. Both towers were designed with sixteen wedge-shaped apartments per floor. Kitchen and bathroom are placed towards the centre, with the living and sleeping spaces beyond separated from the semi-circular balcony by a glass wall. Originally standing on a more open site, later buildings alongside and behind have closed many views but those over the river and beyond remain spectacular.